A Properly Maintained Asphalt Shingle Roof Will Protect Your Home Well. ECO Commercial Roofing supplies first-rate repairs for roof shingles in Texas, Louisiana, and Mississippi. We stand as the premiere choice in the area, whether you require replacement, installation, or repair services. The next time you necessitate shingle roof work, whether for new house construction or fixes to a current roof, give our team your leading call at (833) 200-0571. Asphalt shingles represent the most dominant option for roofing system components. In addition to durability and ease of restoration, you also get a near infinite selection of design choices. The long-term existence of an asphalt shingle roofing system requires sporadic fixes and replacement. Remain vigilant for a few signs if you’ve recently weathered through a storm, or if your roofing system has become aged. We Install Quality Shingle Roofs! Most shingle roofing systems own a lifespan of 20 to 30 years. A roofing system that lies inside or exceeds this spectrum can stand as a prospect for replacement. Shingle roofs break down most frequently due to advanced age. Keep an eye on your neighbors if you do not have the age of your roofing system. Homes in a neighborhood regularly have similar age, so a number of replacement roofs can offer a indicator that you also need one. 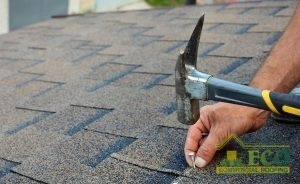 Should you notice shingles vanished to a weather event or high winds, then you should obviously get them restored. Aged roofing systems with inadequate viability can also begin to lose shingles. Trust a professional check-up to show whether you need simple repairs or comprehensive installation. 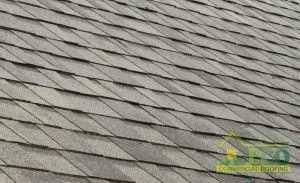 The same goes for curled, cracked, or buckled shingles. Your roof has become unsuccessful at its number one purpose if displaced or damaged shingles have provided a passage point for water. Added protection against damage and the weather provide the utility for granules on your shingles. Losing granules leaves your shingles susceptible. As you cleanse your gutters, stay vigilant for a worrisome amount of roofing granules. Though shingles will lose some granules normally, a gratuitous number suggests they have become either faulty or aged. Shingles are both a relatively cheap and appealing option for a roof. You can count on its protection if you maintain the good repair of a shingle roof. To find out more about roof shingles in Texas, Louisiana, and Mississippi, or to set up time for an inspection, give ECO Commercial Roofing a ring at (833) 200-0571 right away.